[AUTO]:Forerunner [ACT](RC) Generation Break 1:[Counter Blast (1) & Put this unit into your soul] Search your deck for up to one card with "Overlord" in its card name, reveal it to your opponent, put it into your hand, and shuffle your deck. Final card of the week is new Undeux, who's basically Fulbau Brave but has much more practical use. He packs Forerunner, no surprise, and his GB1 skill: CB1 and move to the soul to add an Overlord to the hand. You're basically only looking to use him if you need the Ace going off for certain on a turn or you need Stride fodder but drew little else. He also works for some niche builds that don't run many Overlords but need the sure-fire way to get them, like the gimmicky Dauntless the Legend deck. Next best thing to old Conroe. So the boss screws up and never sends me the new Novelle for last week, I thought we only had four, so we were going to review Novelle again this week, but after I found out, well, this was the card we chose to replace it. 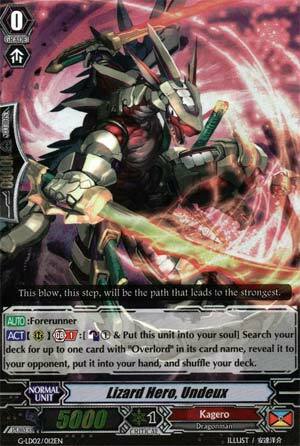 So we're looking at Undeux, which, at GB1, lets you put it into the soul and search for an Overlord from the deck. Dunno about you, but this seems useful, very helpful in previous Overlord-based decks as well. Makes The End more reliable, if you still want to run the Breakride+Rebirth, this helps a lot. But, it's nice to see they didn't forget about Undeux.